You must make reservations at least 5 minutes in advance of the time at IndeBlue - Philadelphia. Discounted parking at Park America (12th & Sansom) with business card. $10 parking 7 days a week at the Express Holiday Inn (13th & Walnut). Indeblue is perfect for business lunches as well as larger parties. Please contact us for details. Please call the restaurant or contact us through our website and our Event Manager will contact you within 48 hours. Indeblue offers a fresh, modern take on Indian cuisine as well as traditional Indian favorites. We showcase fresh meats, local produce and house-made cheese and breads. We take pride in offering a variety of vegan, vegetarian and gluten-free menu items that are both creative and full of flavor. 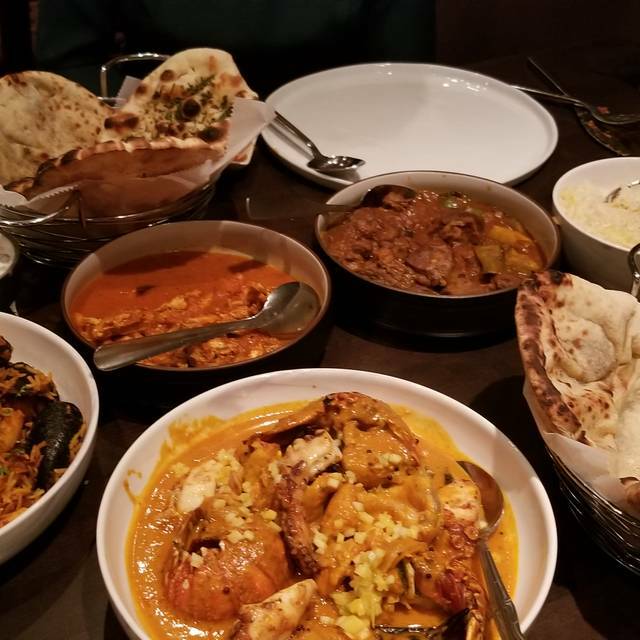 Chef Ramola will take you on a culinary journey through the many regions of India. Our knowledgeable and courteous staff will guide you through your dining experience. Indeblue is located in Philadelphia's vibrant Midtown Village and offers a full bar with an extensive wine, beer and cocktail list. There’s a reason why Indeblue ranks as one of Philadelphia is top restaurants. The reason is the innovative approach to their cuisine…melding modern and traditional Indian influences. My family and I go here often and we have never been disappointed. On this past visit we were once again wowed by the monthly specials including an amazing chicken soup. 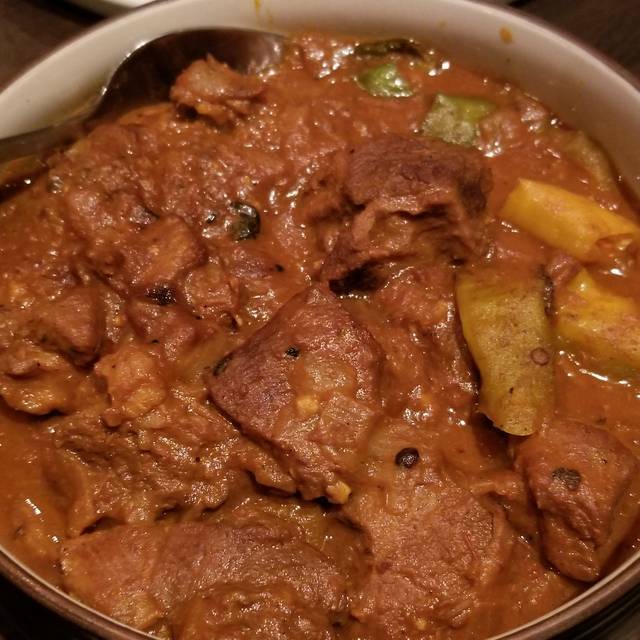 It’s hard not to fall back on some of the old favorites like the spicy cauliflower and the spinach chat... which I actually found out was invented by the owner, Chef Rakesh Ramola. Other Indian restaurants have now included it on their menus...Along with fish tacos, another original creation on this fusion menu. My daughter and I could not resist the poutine fries which were topped with shredded lamb, cheese curds, and cheddar cheese...sort of like an Indian version of disco fries.My son also had a lamb dish which came with Indian bread and assortment of delicious sauces as toppings. My main entrée was an Indian inspired seafood risotto. It was loaded with calamari,shrimp and scallops. My wife would not let us leave without ordering dessert. 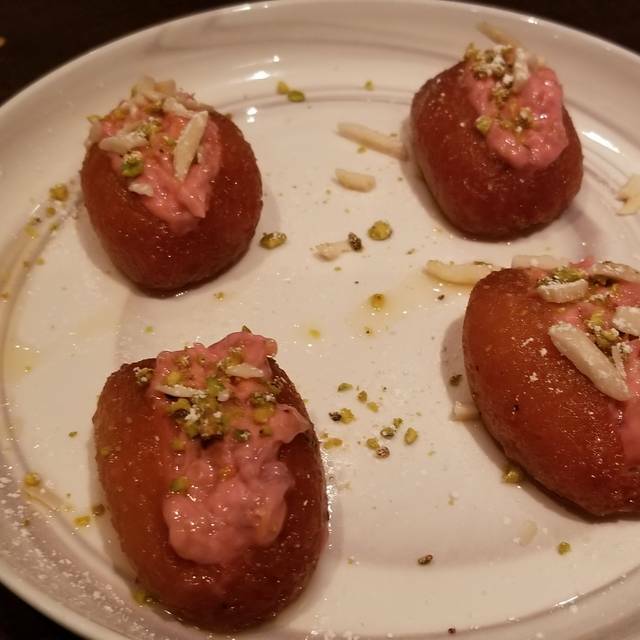 I had a chocolatey pot Dr creme...my daughter had a spiralized pear that was deep-fried and served with a rose water drizzle. My wife had mango sorbet. The service is always friendly and accommodating. They even let me have a drink that I created myself… It was a mango lassi on ice with spiced rum floated on top. Delicious and refreshing. We can’t wait to go back. The prices are very reasonable and they have an outstanding brunch that they serve both on Saturdays and Sundays. My daughter is graduating college and we are looking to have a gathering here. We cannot wait to return. Thank you Chef Ramola. Food was great! Only negative comment was the wait. We had dinner reservations at 6:45 and got seated at 7: 25. Our server was wonderful! Will be back just for him!! Wonderful experience, would definitely recommend and go again. 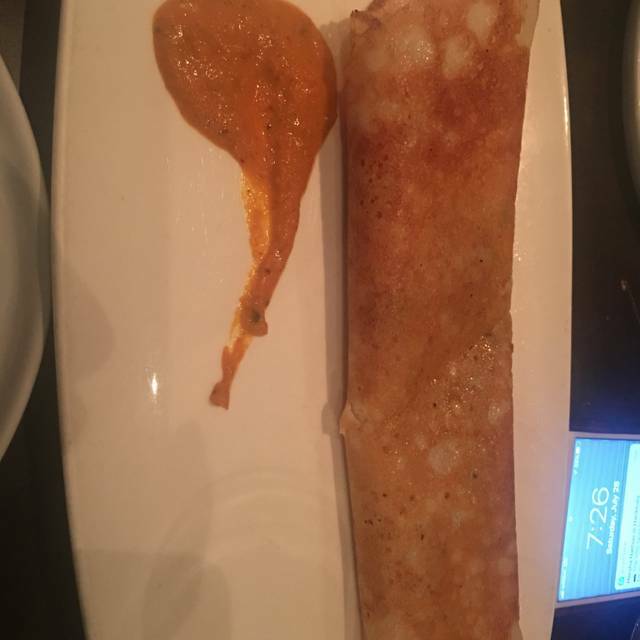 This is the best of Indian food in Philly and the service is tops! One caveat...the greeter upon arrival is not very welcoming. She showed us to the worst table and said we couldn't be moved since a large party was expected. The table for two is adjacent to the bar. It is very loud and you are frequently bumped into as the tables are very close to one another. Cool place, great food and ambiance. A little noisy for a tuesday evening. I would go again!! Excellent service! Food was delicious! We are pescatarian and found delicious options easily! Will definitely recommend and return. My companion and I were seated around 6:00 p.m., the time we had reserved. The restaurant was nearly empty, and so we had excellent service with a lot of attention paid to our needs. My companion had a cocktail to start off...I don't remember what it was, but she loved it...and then we split four small plates. All were delicious; we polished them all off. Although small, the four were substantial enough that we were satisfied. We sat and talked for a little while after we finished eating, and our server brought us each a delicious chai tea, gratis. That put a lovely ending to a delightful meal. I normally don’t write reviews but I just had to do this. This restaurant is simply amazing!! Bennett whom I was fortunate to have as waiter and Lori who also was a waitress, and the entire staff were so welcoming, loving and amazing!! Bennett suggested food to try and every one of his choice was wonderful! The food was exquisite - the sea bass, lamb chops, kale chaat, goat mirchi and chai absolutely tasty and beautifuly balanced flavors. This is a gem of a place! Thank you Bennet, Lori, the talented chef and everyone at IndieBlue! You rock!! Nice Ambience, Fantastic service, Courteous Staff, and last but not least Excellent/Quality food. Good service and kind & professional staff. Nothing negative to say. Highly recommend the tasting menu. Will frequent again soon! 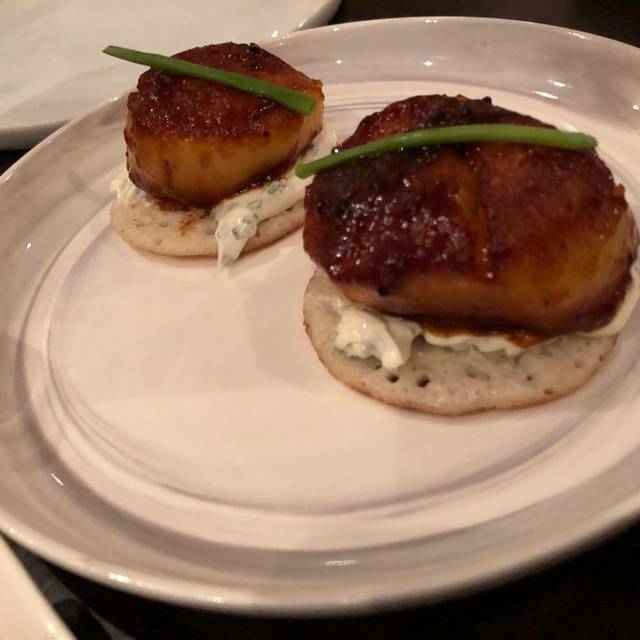 Our first trip to Indie Blue and we had a truly amazing meal! We tried the tasting menu, giving us a chance to explore the incredible menu choices. Great creative dishes with traditional flavors prepared with hints of French, Italian and Asian cuisine. Had terrific cocktails from a large selection of options. The service was really good, attentive and personable. 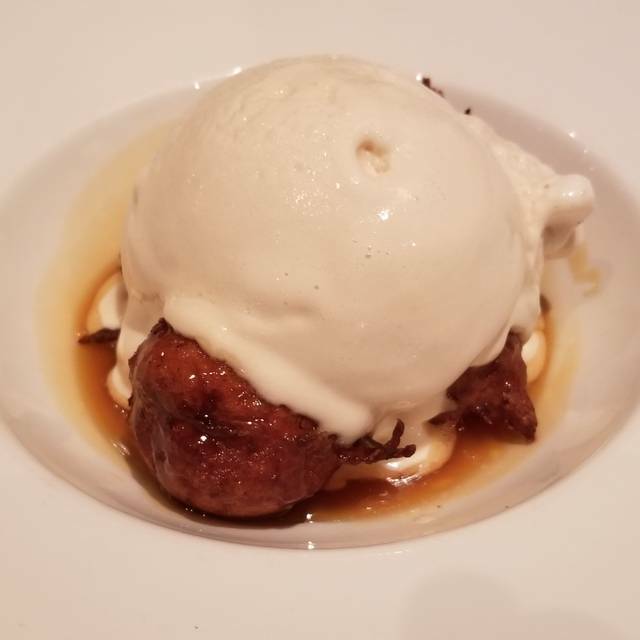 It was fun to hear how excited the servers were about the menu and meals, commenting on personal favorites and sharing information about the chef’s background and culinary style. Decor soothing and classy! Went for Brunch, be warned the Sunday Lunch menu has a "limited" Indian food menu and has a more traditional breakfast \ Brunch menu for most of the period of time. We hit the spinach, the cauliflower and the chicken tika skewers and they were all excellent. Attentive wait staff, and good service. Will have to come back for Dinner and see the full menu. Fabulous dinner and thoughtful servers. My first time here and I will definitely be back. The portions were ample and amazing. A great meal. It was my husband’s birthday and they brought him a free dessert and a candle which I thought was such a nice touch! Great food and a great atmosphere! Went there 2 times in 3 days! Will go again!! Loved the crispy spinach appetizer and madras chicken. Service was great! Wife and I spent many years in DC and we miss the weekend bottomless brunch scene. Liked the idea of an Indian inspired brunch so made a reservation. The food was impeccable; very well done. Great presentation and flavor. Fairly quick from kitchen to table. The mimosas did what they were supposed to do (if you prefer sweet, go w/ the “Rose”; if you like tart, go with “Classic”). The venue is relatively small and seating is a tight. Overall, great ambiance, food, and drink. Highly recommend! Server was great and offered many suggestions for our table. Amazing. Blown away. Perfection. From the food to the service to the ambiance- start to finish it was heaven. Our server Lori put the whole experience over the top. She made exceptional recommendations and was the perfect blend of engaged without being overbearing. The chai is beyond anything you’ve ever had. 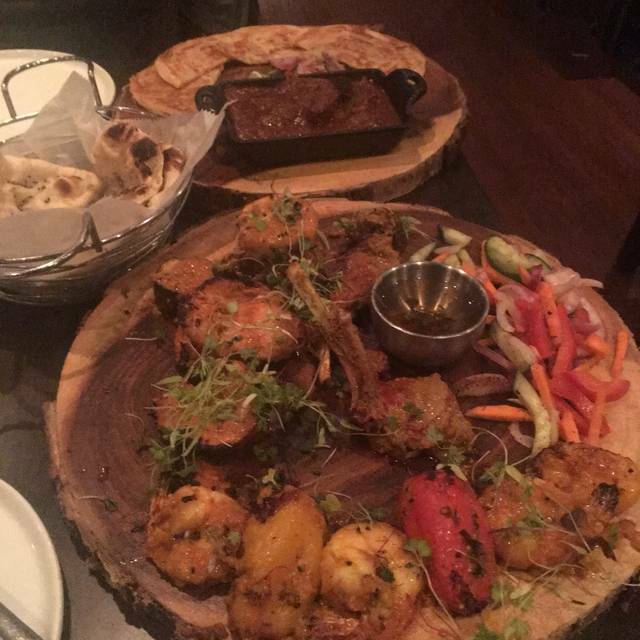 The tandoori platter was incredible. Makhani- best we’ve ever had. Naan was perfect. 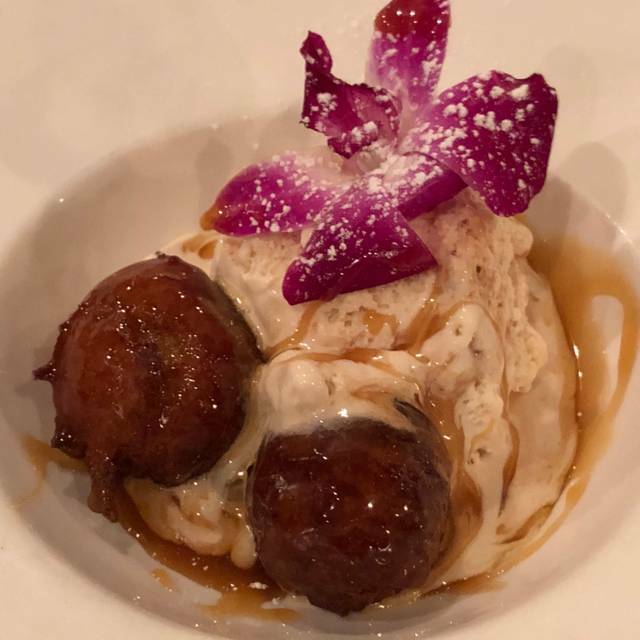 Dessert was mind blowing. I literally would not change a single thing. In the top three greatest dining experience of my life. Saturday evening dinner very good. Noisy but great service. Toasted spinach with yogurt dressing is unique & delicious. Tika chicken succulent. We”ll be back! Amazing! Our server was phenomenal! He helped us make all the right choices! Fantastic food and service. This was our first visit, and we decided to try the tasting menu. It was A LOT of food, and all of it was delicious. I would recommend IndeBlue to anyone. The cocktails were incredible too. We have been to IndeBlue countless times but this was our first time for brunch. The place, as usual, was extremely lively and we knew we were in for a great meal and pleasant time. 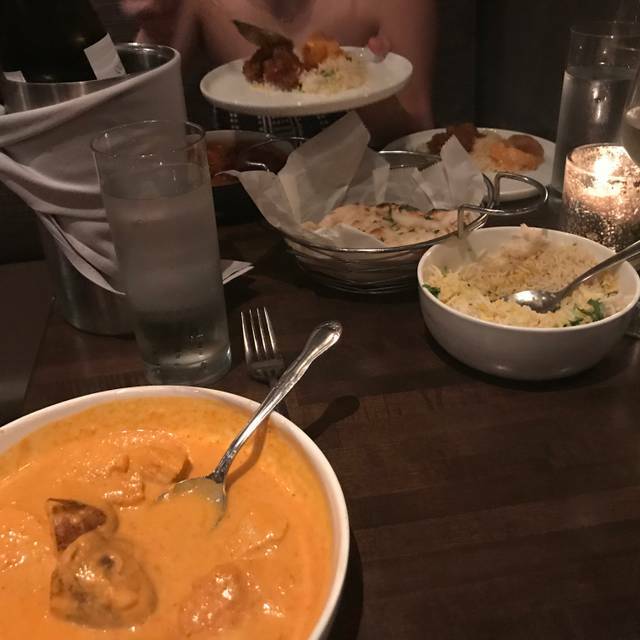 This restaurant makes the best Indian food I have eaten in any city. We also had brunch on Sunday and it was equally wonderful. The service is excellent from the whole team. IndeBlue is gem as it provides the experience of Indian cuisine in more modern way instead of traditional Indian cuisine presentation. The menu options are excellent and each one we ordered exceeded our expectations. The service is very friendly. The decor is very charming. Outstanding food and an enthusiastic and knowledgeable server made our dining experience an excellent one. The service and food was top notch! My son surprised me by giving me $20 to add to the 25% tip I was already giving our waitress Laura. We had the best conversation with her. A sweet person. My kids were impressed. She cried when we gave her the tip. This is now one of our favorite restaurants. Food was really really good but the staff was truly exceptional. Not in your face at all, checked in the perfect amount. So friendly and helpful. We were three for dinner but wanted to split some things and they were helpful in our careful (and vegetarian) and meticulous order planning. Very patient haha. We had an awesome time! Our server, Tori, was amazing! She knew the menu inside and out and was very personable. The food was great too! Great service, knowledgeable and helpful staff. The food was amazing and portions were good.